This is another type of hawker food commonly found in Singapore..It is sold usually together with those stalls that sell the fried carrot cake. 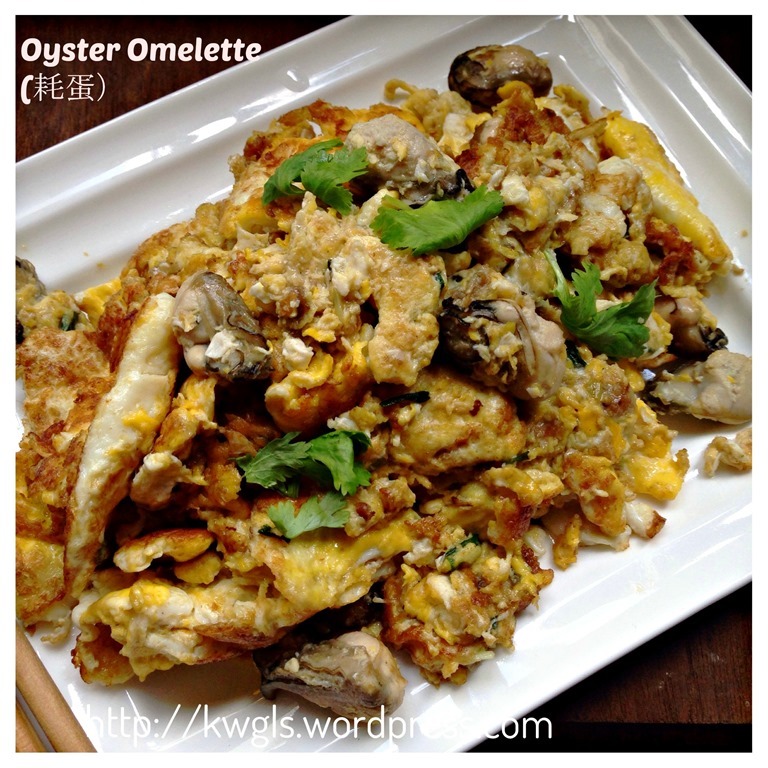 This is another of our favourite hawker dish of Teochew origin. 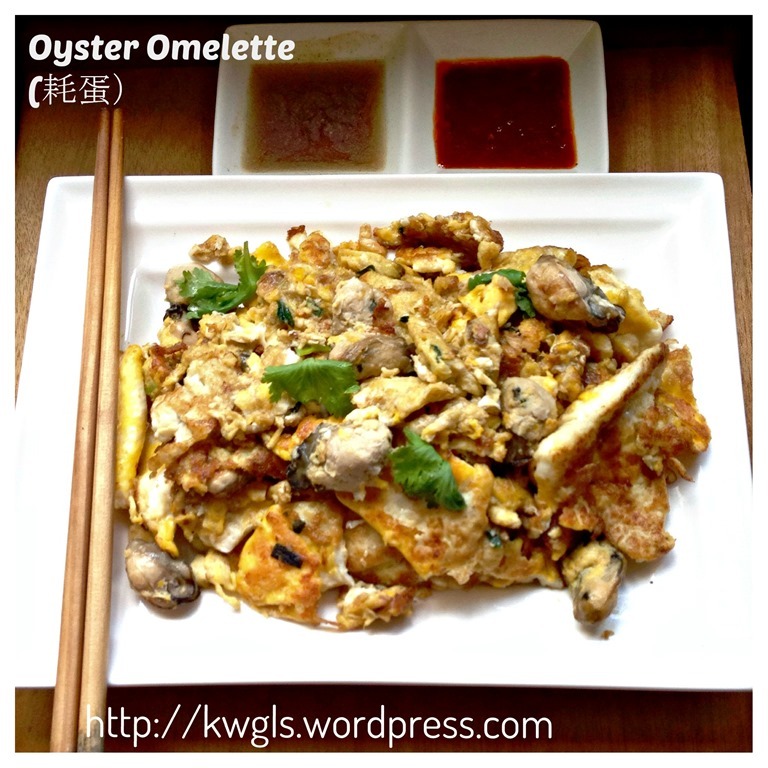 There are many versions of oyster pancakes. 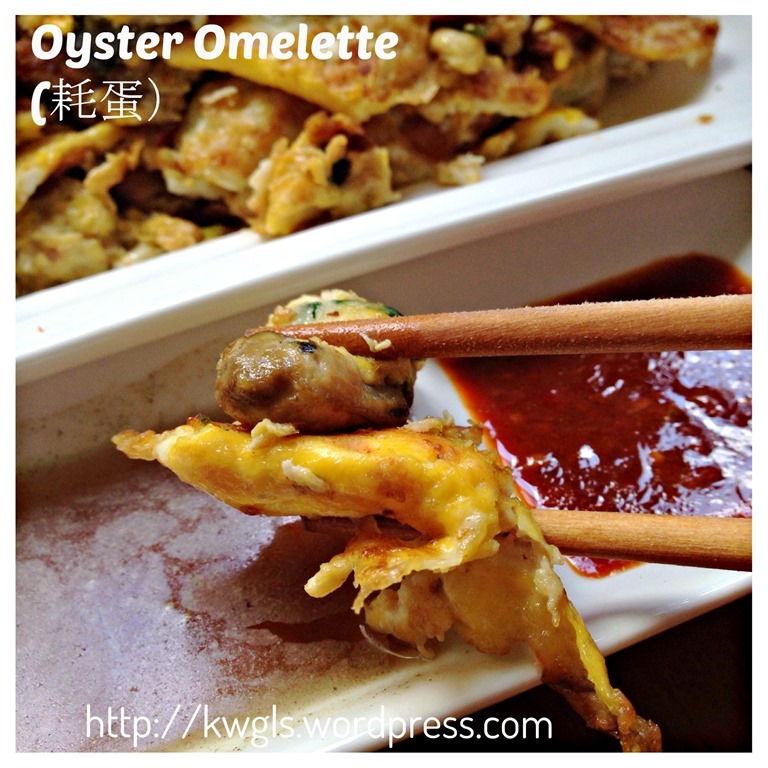 It can be thin or crispy (as in Kuching) or it can be soft and gooey (Melaka and Penang). 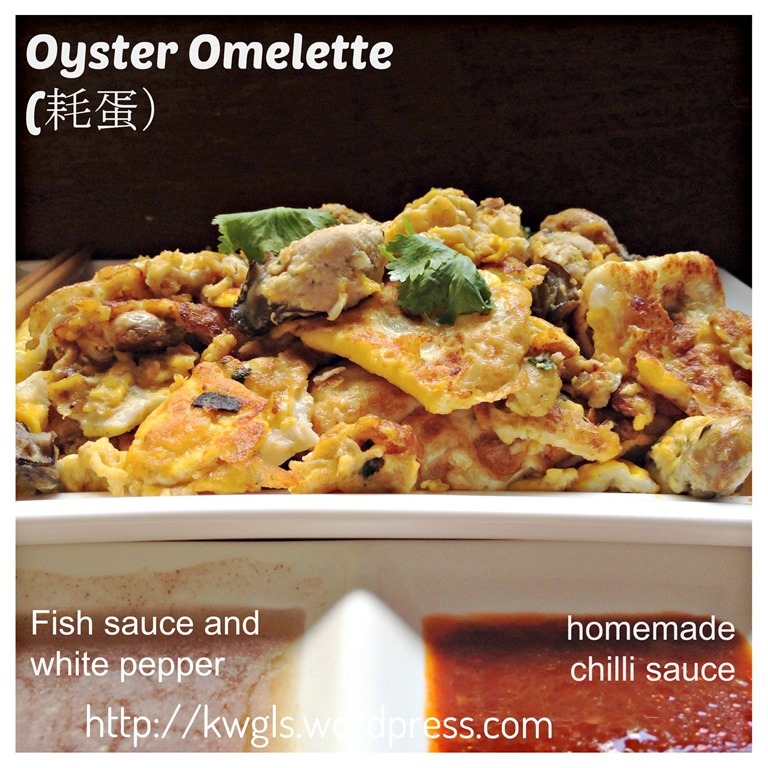 It can be a version whereby most of the pancake were made from tapioca starch with less eggs called O Luak or O jian (耗煎) or a version whereby it is stir fried with eggs called O neng (耗蛋）. 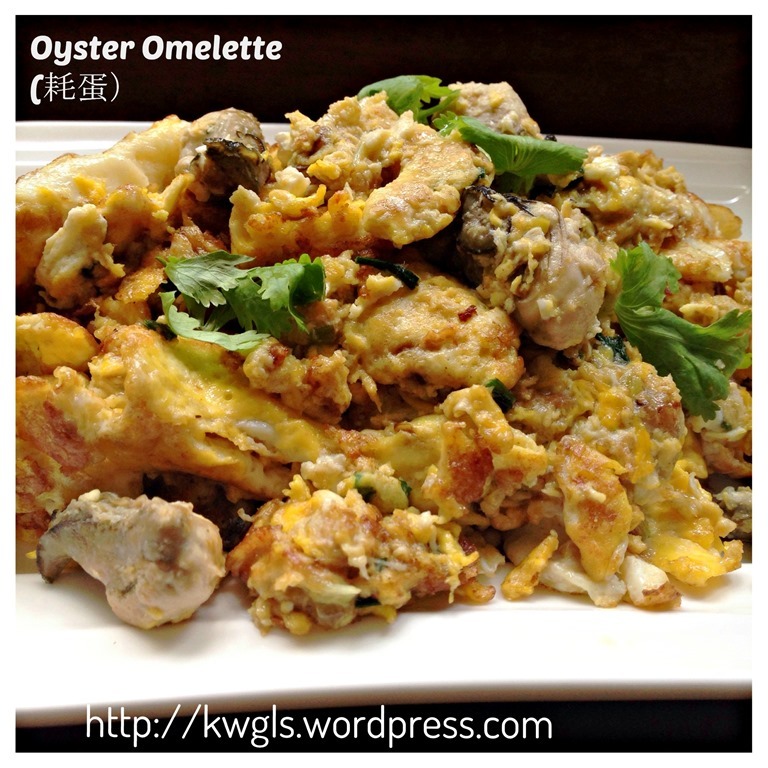 What I am sharing today is the version that uses mostly eggs and less tapioca flour. 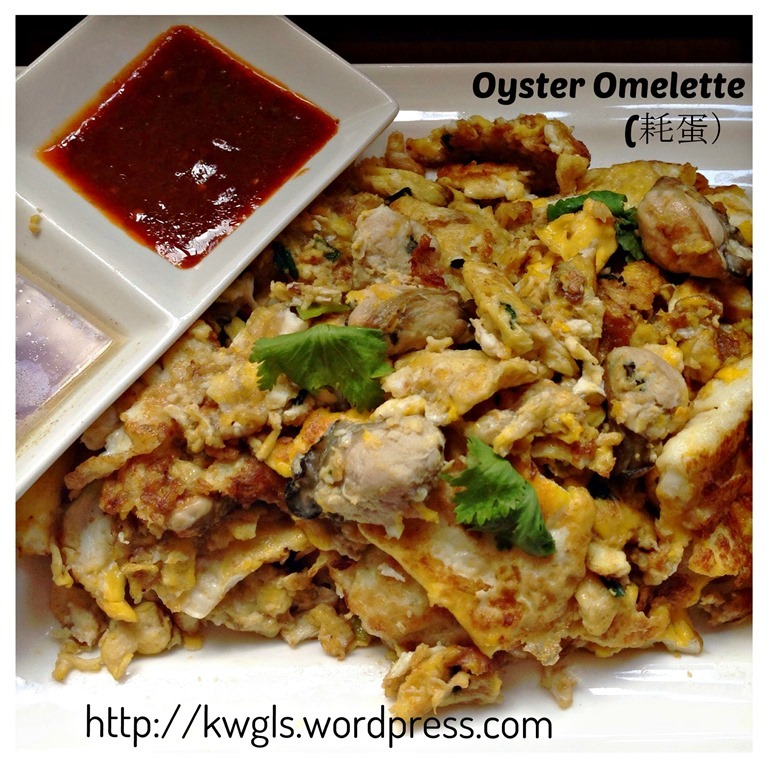 In my humble opinion, a good oyster omelette should have a balance of crispy eggs and soft oysters that are not overcooked. 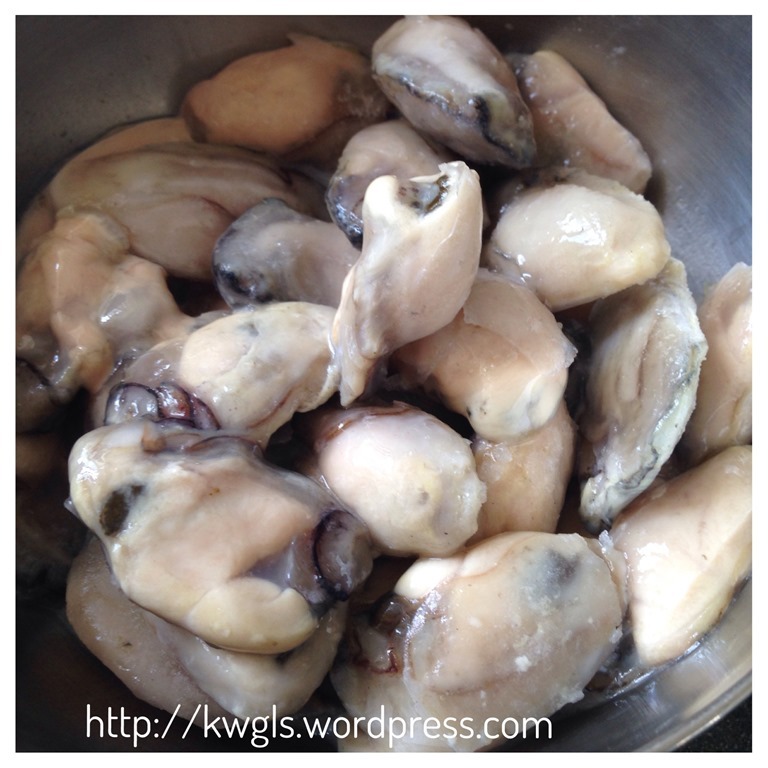 Defrost the frozen oysters completely, wash carefully in cold water and drain well. Mix the tapioca/corn starch and rice flour together with the water and make a watery starchy solution. Set aside for later use. Heat the shallow flat frying pan with 2 tablespoons of oil. Stir fry the white portion of the spring onion and garlic until fragrant. Pour in the starch solution until the batter is half cooked (about 15 seconds). 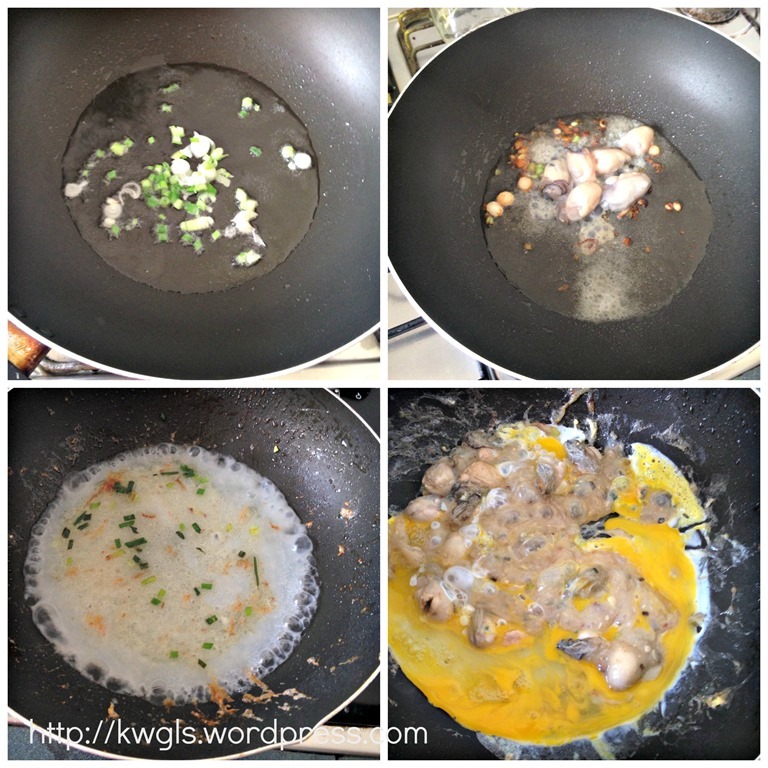 Add in the beaten eggs and when the eggs are almost cooked (set), add in seasonings such as fish sauce and white pepper. Stir until well mixed. 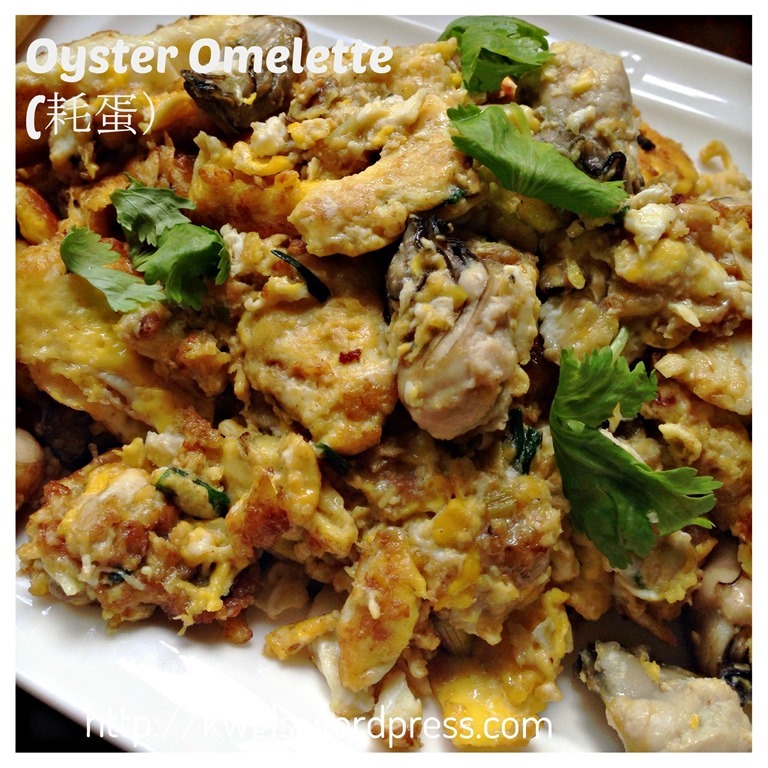 Add in the fresh oysters, stir fry for another one minute. Off the heat and garnish with coriander leaves or spring onions. Best served hot as a snack with home made chilli sauce or additional fish sauce dusted with white pepper. A very simple dish. Nothing to shout about. 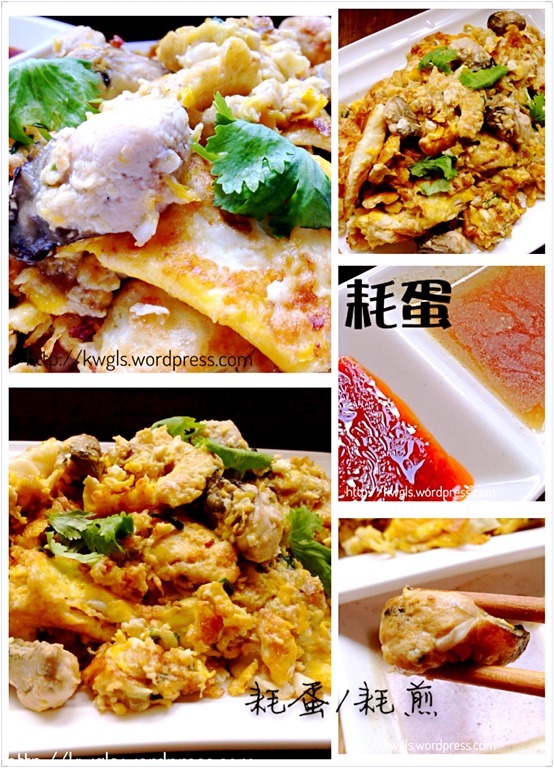 If you like the tapioca flour, do add a bit more and use less eggs to become O Jian. 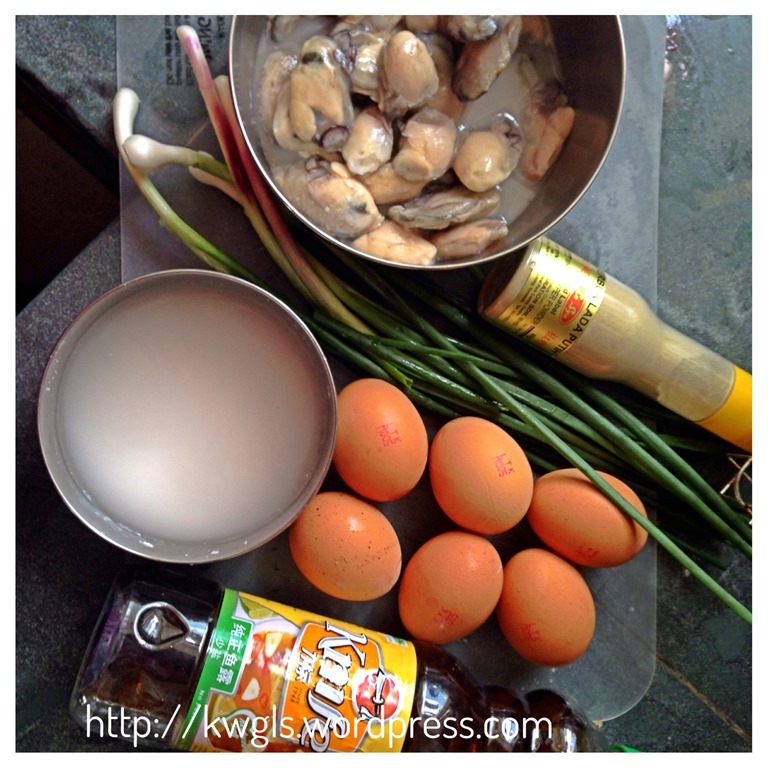 Remember that only add the oyster at the very last step to prevent over cooked. Oyster can get cooked within 30 seconds. Do give it a try. 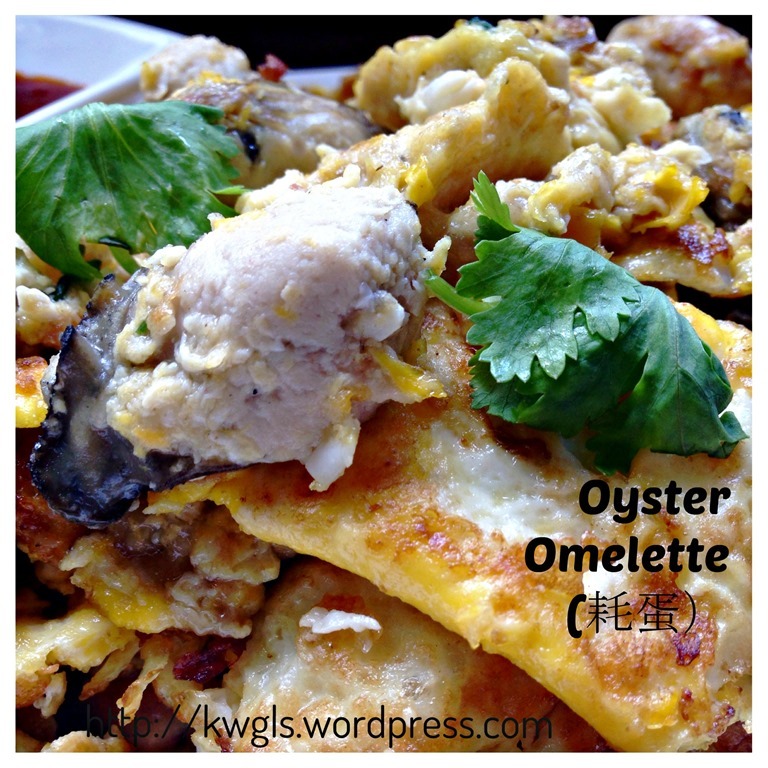 This entry was posted in Chinese and Asian Cakes and Snacks, Food Preparation Series, Snacks and tagged 8, 耗煎, 耗蛋, GUAI SHU SHU, Guaishushu, kenneth goh, oyster egg, Oyster omelete, oyster pancake, postaday, 可利煎. Bookmark the permalink. Please tell me if there is any difference between tapioca flour and tapioca starch? Thank you. I think it should be 2 tsp of fish sauce instead of 2 tbsp. I tried with 2 tbsp and was overly salty! I am very sorry, it is my oversight.. I apologize again. 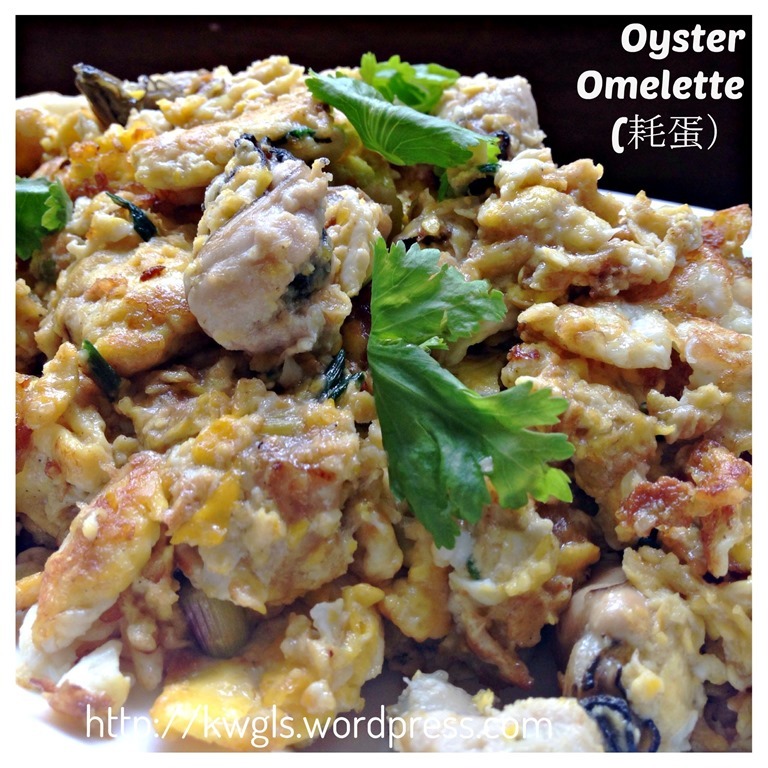 I tried this recipe for 3 times but I cant get the texture, quite wet and soggy.